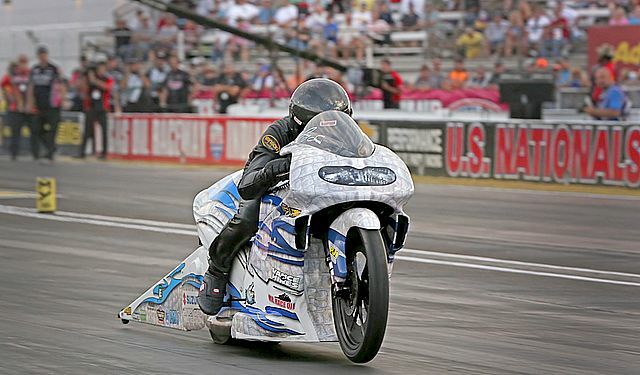 Jerry Savoie’s White Alligator Racing (WAR) continues to show that it is the strongest Suzuki Pro Stock Motorcycle (PSM) team in National Hot Rod Association Mello Yello drag racing, and maybe the strongest team overall. 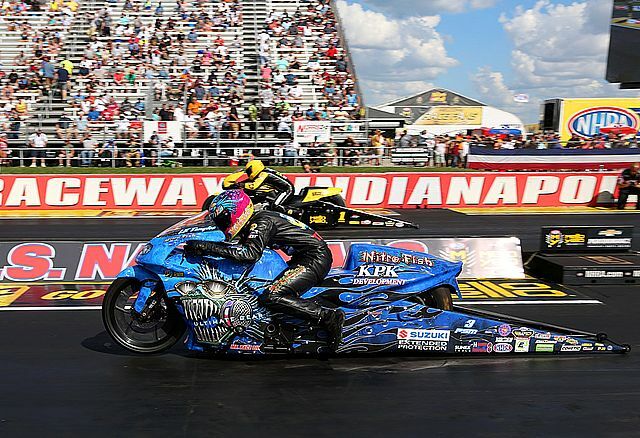 Rider LE Tonglet took the team’s second U.S. Nationals win at Lucas Oil Raceway near Indianapolis. “The Big Go,” as it’s called, is the world’s biggest drag race and the most treasured of NHRA’s “Wally” trophies. Making this win even sweeter was the runner-up in the other lane—four time champion Eddie Krawiec of the powerhouse Harley-Davidson/Screamin’ Eagle team. “We’ve got something for them this time,” Savoie said as his team approached the starting line for the final, and he was right. No detail or performance advantage was overlooked by tuner Tim Kulungian and the WAR team in preparing Tonglet’s Suzuki for this one shot at Indy greatness. “I have all the faith in the world in Tim and everybody on the team that our bike is going to be one hundred percent when I stage,” said Tonglet. Krawiec had lane choice and chose the right. The tree came down and Tonglet took the start by a scant .006 of a second. LE then used all the skills that have made him what many consider the best combination of rider and racer on the PSM circuit. “I felt the bike moving a little out of the groove so I gave it a little move back,” Tonglet said nonchalantly after the final. The ability to move a Pro Stock Motorcycle without sacrificing elapsed time (ET) and speed is something many aspiring racers never master. The supremely prepared motorcycle and the unflappable Tonglet’s nuanced moves of hips, feet, shoulders and head produced his second best ET in the worst heat of the day—and the win. Krawiec’s wasn’t the only Vance & Hines Harley–Davidson that Tonglet had to beat on raceday, as the team added Chip Ellis riding a third Harley for Indy and the Countdown to the Championship. The official Vance & Hines line is that Ellis was added to develop the bikes for next year, but the timing of his addition has “blocker” written all over it. Tonglet nailed a .009 light on Ellis in round two, establishing a bike length lead right off the bat that he never relinquished. In the semi, Tonglet actually beat the racer that started the season on the second WAR Suzuki—Steve Johnson. This time around, LE was a little soft on the tree but had enough Kulungian-tuned WAR power to deliver the round win. He also beat Ryan Oehler in round one. Tonglet won the U.S. Nationals on his family bike in 2010 and Savoie won for WAR in 2015. This time around, Savoie’s .008 to .032 starting line advantage didn’t hold up against Krawiec in round one. You can see that the WAR team had to race three times against Vance & Hines Harleys on raceday and didn’t even have a pairing with points leader Andrew Hines. Arguably Vance & Hines’ biggest customer in the class, the WAR team now has to race against a 50% larger V&H Harley team when it matters most—not to mention the rest of the PSM class. WAR’s Indy win was especially gratifying, but it will be a tough battle against the sport’s best-funded team race after race during the Countdown. 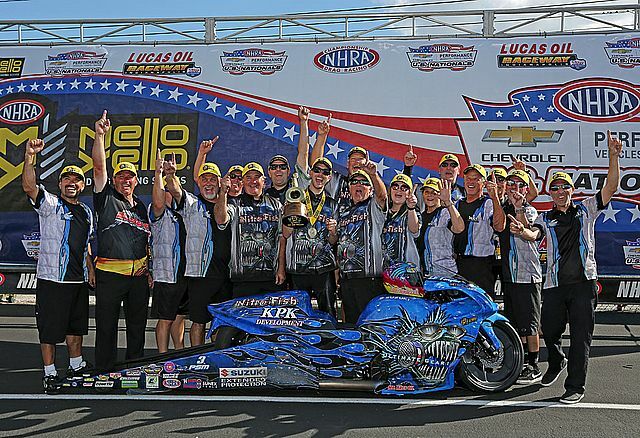 When alligator farmer Savoie started Pro Stock Motorcycle racing in 2011, his intention was to win one Wally. But one has turned to many for him, and Savoie won the 2016 PSM championship—a huge achievement for what was then a one-bike team. Now WAR is a two-bike championship caliber team with the capacity to grow in the future. Savoie has assembled an organization that top quality crew personnel want to work for, starting with brainiac Kulungian and including Rick Elmore, Steve Zelem, Freddie Camarena, and Chris Parker. In fact, veteran PSM racer Camarena hopped on board for Indy to replace Parker through the Countdown as Chris moves out of racing to a different career. “The team’s doin’ great,” said Savoie. “There’s times we’ve struggled with makin’ power, but Tim’s been workin’ on it. He’s a really hard worker and puts it all together. The 59 year-old Savoie then talked about something he’s mentioned for years but seems like he might mean it this time—retirement as a rider. Or semi-retirement, at least. “I‘m gettin’ to that age now where I might just step back a little bit. I don’t want to get out completely—maybe make five or six races. “But I’d like to keep Tim and the team running. The truck and the team will be out there—absolutely, whether I’m out there on a full season or not. We’re tryin’ to set up now what goes on next year. We’ve got some things coming down the pike that I think are pretty impressive. And as we know from last year, the deal between Tonglet’s sponsor Kenny Koretsky/Nitrofish and WAR is definitely not set in stone. The main issue for proven winner LE is to secure some money for himself as his family grows (Tonglet’s wife Kayla is expecting their first). That could come either though additional money from Koretsky or a better share for himself from the combination of his winnings and what Koretsky is already paying. No matter what happens with the riders in the seat, Savoie has established an incredibly successful and sustainable team. The WAR is not over, and with the Countdown to the Championship starting this weekend, the battle has just begun. Jerry Savoie, Tim Kulungian and LE Tonglet thank everyone at Vance & Hines http://vanceandhines.com , PJ1 http://pj1.com/ , Mr. Race Oil http://www.mrraceoil.com/ , Motec http://www.motec.com/ , Kenny Koretsky and Nitrofish https://nitrofish.com , E3 spark plugs https://e3sparkplugs.com , Suzuki Extended Protection https://www.suzukisepdirect.com , tuner Tim Kulungian, crewmen Rick Elmore, Steve Zelem, Freddie Camarena, and Chris Parker, their families, and the staff of Savoie Alligator Farm. The White Alligator Racing team races next September 13-16 at the Dodge NHRA Nationals at Maple Grove Raceway near Reading, Pennsylvania.